A Customer Service Knowledge Base is a series of questions and answers, combined with tutorials, that customers can use to help themselves before coming to tech support. Essentially, it’s a more advanced FAQ (frequently asked questions). It’s useful for the tech support team because they don’t have to use as much time dealing with the same handful of questions and can instead focus on the more difficult problems; it’s also helpful for customers because they won’t have to spend all that time dealing with the typical hassles of phone support if they are capable of solving the issue themselves. The trend toward customer self service is moving quickly, as a result knowledge base software offerings have evolved to simply implementation. According to a study by Forrester, participation online help forums increased from 31% in 2012 to 56% in 2015. A 2016 study by Aspect Software found that 71% of consumers want the ability to solve most customer service issues on their own — a jump from 64% since only 2015! 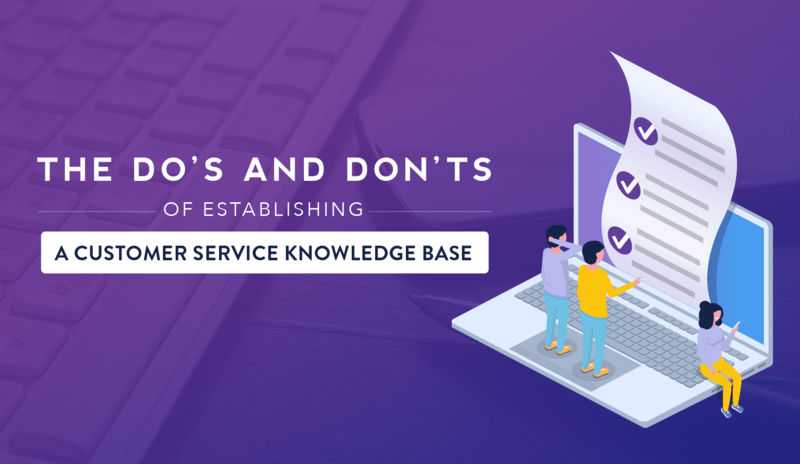 So with that in mind, here are some tips and other things you should skip when making your customer service knowledge base. Chatbots, which automate the initial contact with the customer a great tool for several reasons. The first is immediacy—The first place a customer with a problem is going to look is your web page. If you have a pop-up that can offer help, or at least tell him where to look, you’re off to a great start. Chatbots work 24 hours a day and can look up answers faster than humans can. If the answers don’t fall within the database, it can give the customer the number for customer service or start a ticket automatically. When picking the best chatbot provider, consider how you want your customers to interact with it. 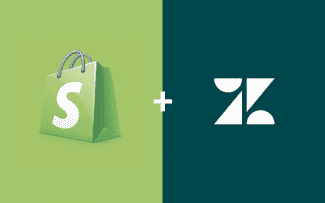 Zendesk, for example, has an option to pop up when the customer is on the checkout page. The bot can suggest similar products, and answer questions about the products in the cart. 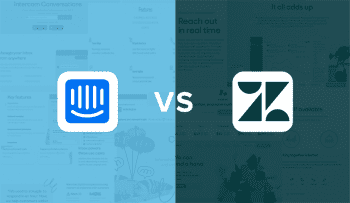 ZoHo Desk and Freshchat both speed the customer to a live agent, while Salesforce puts more muscle into the AI to personalize the experience but hold off on a live agent a little bit. You can see five of our top picks reviewed here. You should design discrete help menus for desktop PCs, mobile phones, and apps. In all cases, your titles should be clear and concise. Your most frequent problems should have a high real estate value on your support page. Make sure to have a conspicuous “contact us” badge in case they can’t find what they’re looking for. But above all else, have a search bar. Thanks to Zendesk for these tips. A dense wall of text is your mortal enemy in a self-service situation. Being visual means both using graphics and keeping your page organized in a way that doesn’t overwhelm or confuse the customer. If your product is tangible (e.g., an air conditioner, a musical instrument), include pictures of your different products on the page that you customer can recognize. If your product is a service or program, your text boxes are your graphics. Road test the heck out of your knowledge base on different devices to test for readability. Practice with Android and iOS, tablets, phablets, and everything in between. Remember, your customers will have a large range of age, abilities, and tech savviness. The less clutter the better, but you will have to use your judgment to decide what to put where. This is where you really have to invest your time, or really entrust your provider, in how to best organize the sections your customer is going to use. When designing the layout, take a few companies you admire and check out their knowledge bases. Whatever format they have—a grid, big pictures, clipart, whatever—think of how well it would work for you, and how you would put your spin on it to use for your own service. But, at the same time, don’t get so in love with visual flair that you lose sight of how the customer is going to use the page. Your customer has a limited amount of patience. The more clicks and pages a customer has to deal with, the quicker his mood will change from “I got this, no problem,” to “this is too much trouble, why am I dealing with this company?” I know that sounds harsh, but it’s the reality of modern customer support. We all know that feeling of being slowly defeated by an unresponsive phone tree and taking it out on a poor customer service rep that’s trying to help. You don’t want to be on the receiving end of that, either. You are constantly updating and improving your product or service, and your knowledge base has to keep up with that. You don’t want your customers following outdated instructions. Just as bad, you might have a hyperlink to a dead end or a video that won’t load because you fixed some typo months before. Do regular audits to find what pages are visited most and least frequently and why. When making and beta-testing changes to your product, make documenting these changes part of the process. Make sure your support team is learning from the base, and fix any inconsistencies that come up; these are most likely to come up when training new staff and when sending links to customers. If a support staff ever says the phrase, “the manual says do it this way, but we really do it that way,” it’s time to change that manual. Here’s an idea: set up a bounty system, where any support staff that finds outdated material gets a prize. It can be as cheap as a 50-cent trinket, but the recognition outweighs the money. Your company has a voice. Your knowledge base has to, too. You want your knowledge base to not wildly vary in tone and formatting. You don’t want to have multiple articles that say the same thing when you can combine them. Start out with templates, so all articles have a common structure. 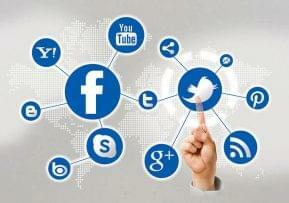 As you make changes, constantly make sure related articles keep up with those changes. You can make this easy on yourself by writing the content with the visual in mind. I don’t just mean graphics, but also the categories. You want your users to find the knowledge base to be intuitive, so don’t throw a lot at it and see what sticks, instead start with the basics and expand. If your company evolves in some way, make sure the knowledge base keeps up, and rewrite some sections if you have to. You’ll have users of all different skill levels trying to help themselves using your knowledge base. If a customer can’t understand the answer because it’s too heavy on insider language, they’ll pick up the phone and call your tech team, which is as good as them not having read it in the first place. You want the knowledge base to be easy to read – not just by you, the expert in your own creation, but by regular people who wear mismatched socks. Not every article has to be an exercise in dumbing down complicated subjects. Any time you have pages that include industry jargon, either explain it quickly, or include a link to a glossary of useful terms. If some term depends on knowing other terms, or is in some other way too difficult for a novice, consider giving the term itself its own page, or link to an article by a trusted third party that explains the concept. Not everyone who uses your product is going to create an account. But even if your product is subscription-based and everyone does have an account, what happens when you forget your password? No one wants to spend five minutes creating or resetting an account just to find out the best answer was to flip the switch off and on. Allow anyone to use the knowledge base, whether they want to log in or not. Remember, your customers are in a hurry. Every step that puts them farther away from the solution shortens that fuse until they blow up. Some steps are necessary to help find the best answer, but having an account to use a knowledge base isn’t one of them. There’s a certain service I use as a backup phone service. I use them because they are very inexpensive, but I know coming in that means if I have ever have a problem, I have to dig very deep to find customer support beyond their knowledge base. I can tell very easily that they are hiding from customers to keep their costs down, and that’s why I only have them as my second phone. I’m guessing you don’t want to be anyone’s “backup,” you want to be first. Never hide from your customers. Your knowledge base should have any other options, like social media, email tickets, and phone numbers, in a conspicuous spot on your tech support landing page. You want to be able to solve every problem. That’s natural. But when you’re building your knowledge base, you’re better off with quality over quantity. A big mistake you can make is to put as many pages out there for every conceivable problem, if you do it at the expense of making a clear, understandable knowledge base of solving the most important issues. Start with an achievable number of questions you need answered. See what works. Get your technical problems out of the way before you make a hundred dead links. Find out what drives traffic and what you can learn from it. Start building a community. Expand from there. 9. Don’t Think “Someone” Will Do It. If You Do That, No One Will. You must assign at least one specific person to write the knowledge base. Unless it naturally evolves otherwise, it will be set vision of this or these workers who know the product inside and out. This will be assumed to be a full-time responsibility, which means you must take the active step of delegating the other work that this person usually does while they are building the base. It isn’t a life-long commitment, but it is a specific assignment, with measurable results, with a clear but flexible timeline. Here’s a great list on uberflip about how they built their database from scratch. They decided first who would be responsible for creating, editing, and updating the content, then how often it would be updated and reviewed, and what format they would use. Similarly, don’t think you can “set it and forget it.” If you are under the impression that setting up a knowledge base will be a one-and-done proposition, let me disabuse you of that notion very early. Your knowledge base, like your product, will be constantly updated and improved. There may be links that are moved, product names that are renamed but have the same functionality, and so on. That’s part of the gig, but the good news is that that the more you put the work with the database, the more effective your support team will be in the long run. Your knowledge base needs actionable content. But that action shouldn’t be buying more products. Your customers need help, and they’re going to be annoyed that your solution is for them to give you more money. There may some cases where the best answer for a customer is to upgrade to a better service. And there are some companies that sell premium help as part of a higher tier. That’s acceptable; this shouldn’t be an absolute rule, but don’t turn every article into a sales pitch. The true paradox of creating a knowledge base is that you’re so busy solving the same small problems over and over again that you won’t have time to create a knowledge base that handles the small problems. If you need a knowledge base, you’re on your way to making it, so look it as a high-quality problem. There’s no one most important thing, but let me leave you with this: start small, start simple, don’t be ashamed to start over if it isn’t perfect on the first try. Your customers have to learn how to use your product, and in the process, you have to learn how to teach them.